Tangled: Before and After is such a FUN IDEA. We saw Rapunzel’s BEFORE story. We know that she eventually marries Eugene…. but what exactly happens in between. Curious? ME TOO! Thankfully, there’s finally some meat for our bread sandwich and it tastes like a series we are all going to love. How do I know? Because I previewed it!!! 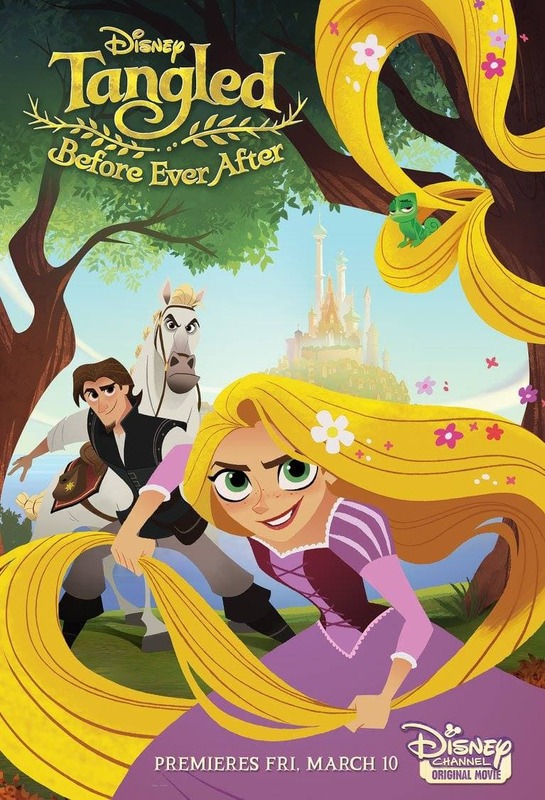 ‘Tangled: Before Ever After’ Showcases Life For Rapunzel Before Her Wedding. How cute is that??? 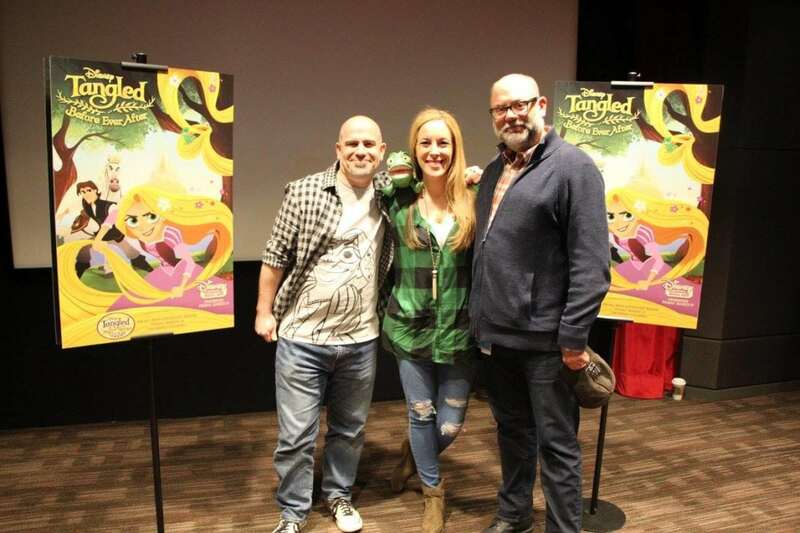 I spent a day out West with Disney interviewing the executive producer /supervising director Chris Sonnenburg as well as supervising producer Ben Balistreri of Tangled Before and After. They both opened up a bit about what fans can expect from the show and why they decided to dig a little deeper into the root of Rapunzel’s budding relationship with Eugene. Both Chris and Ben have already left such an imprint on the Disney property. Collectively, this duo is responsible for titles like “Pocahontas,” “Hercules,” “Mulan,” “Tarzan”, “Fantasia 2000”, “Little Mermaid II”, “Wander Over Yonder,” “Lady and the Tramp 2,” “Cinderella 2,” “The Lion King 1 ½” and “The Hunchback of Notre Dame II.” YOWZERS! And now they get to add Tangled Before and After to the Mix!!! Super fun! We were all so curious about why this team decided to tell the story about how Eugene and Rapunzel got to the alter. Chris told us it was really all about understanding relationships and allowing them to play out on the screen for fans to enjoy. CHRIS SONNENBURG : There’s this great line at the end of the movie where Eugene Fitzherbert, says “After years and years of asking and asking I finally said yes.” It started to become like what do I have to say about this time in these people’s lives, and young people’s lives about getting to know yourself, getting to know the people in your lives, getting to understand your relationship with your parents? And if the kids that had seen the movie in 2010 were maybe 10 at the time or eight then they’re probably getting to be about 17 years old and they might want to know how is this character that I love so much as a kid coming to grips with this part of her life? And that was kind of it for me – the in of why to tell the story and how to tell the story. We all can SEE that Rapunzel is back to blonde in Tangled: Before And After. Why was that decision made? CHRIS SONNENBURG : Well, I mean, ultimately her name’s Rapunzel, right? Long, blonde hair. 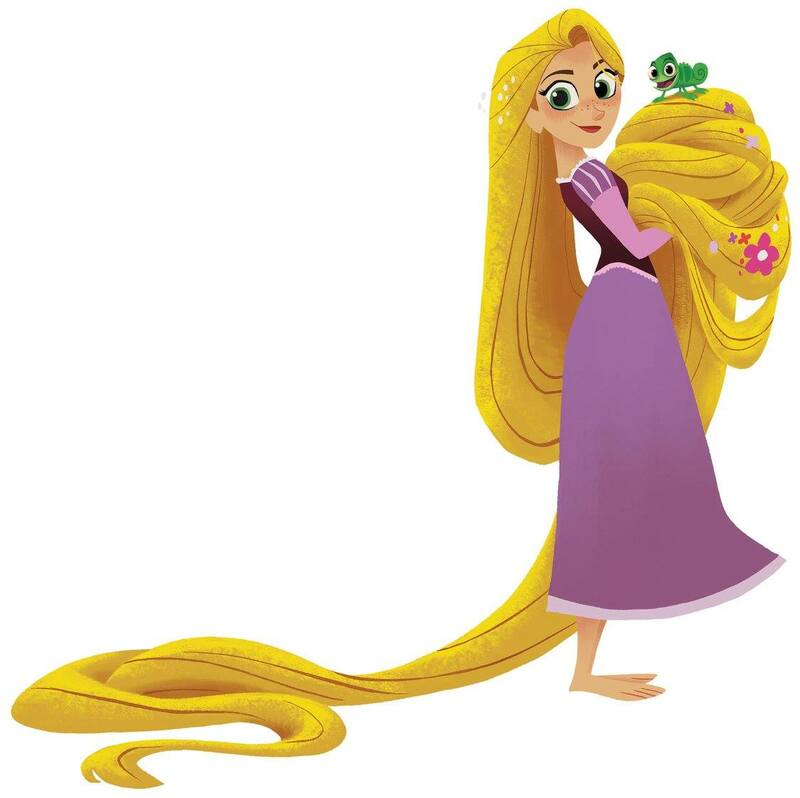 I think Rapunzel has to have long, blonde hair for it to kind of just read as the character. The trick about it and what ultimately was the trick for the filmmakers in the original movie was to give the hair a reason for being blonde and for being long and in our case, being uncuttable. The big story, the big question that we always ask in the story was always why. Why do these things exist? Why are we telling the story? And, you know, her hair represents her personality. It’s bigger than life. It’s bright. It’s long. It shines. It’s magical. It’s pretty much–, it’s pretty much who Rapunzel is. And so, and then the added layer of it, which is being unbreakable has its own reason for being that we’re going to get into as we go along in the story. But it always should always go back to serving the purpose of why does it exist this way. Q : I love the journal aspect in Tangled: Before and After. What is the meaning behind the quote from the mom? CHRIS SONNENBURG : Rapunzel is very much a storyteller and that’s how she would do it. So, we immediately said well, let’s give Rapunzel a journal that she can keep record. She’s going to want to paint on the road. We gave her this journal and then the added element of the inscription came very much from the movie, Glenn Keane who created the character of Rapunzel for the film, had come and I was talking to him about what we wanted to do with the show and he had done this quick drawing for me. I said give me a drawing that–, that’s going to encourage me years as we go into the show. And he had done this picture, this beautiful drawing of Rapunzel and on it he wrote, ‘Plus est en vous,’ and I was like what is that? And he says well, in the movie, we had this phrase that we were using just in the story rooms of like you know, at the end of the movie all of her magic is gone but she squeezes out one last drop of magic out of her. And he said the reason behind that, the meaning behind that is that we all have more in us that we can push through it and he was telling me like when you feel like you’re at the end of your ropes, if you can’t give any more, push through and there’s always more inside of you. And I thought that was such a beautiful sentiment and I thought that the mother would give it to Rapunzel as like listen, everybody has these expectations of you of a princess, of a daughter, of a girlfriend. But the phrase means there’s more in everybody. There’s more inside of Eugene. There’s more inside of Pascal. There’s more inside of Corona than everybody just sees on the surface. You know, we’re going to get into the, as we go into the season, there’s even like tunnels underneath Corona. We heard a few new songs and they were all unbelievable. I had to know – would there be an album in the works? Did I just say album? Man, I’m old! CHRIS SONNENBURG : Yeah, a soundtrack, sure. So, you know, again, Ben said we come from old-school Disney. Part of that is you know, me being very much influenced by the works of Howard Ashman and Alan Menken. And Howard Ashman had given this wonderful lecture many years ago when they were making Little Mermaid that I got to just see on video and where he talks about music and its role in storytelling and how it should really be–, if it’s the most successful it’s really telling the heart of the character and really–, or changing the heart of the character. We really wanted to keep the music special in Tangled: Before and After. We knew our access to Alan Menken was going to be limited. And even if we had unlimited access to Alan Menken, getting a song into every episode not only is it productionally very difficult because it’s so much time for a music, you don’t want to cheat it and it takes up so much time but I didn’t–, I wanted the music to stay special. I wanted it to be used where the characters have something to say and have something on their heart that is going to change their viewpoint on the world. So, those big moments are lined up with what we’re calling our tent poles. We have three big “tent poles” per season. So, we have a season premiere, a mid-season and a season finale. And those are the places where we really have the big musical moments where huge things happen. And when I say big things happen there are going to be times when that’s really kind of like spoiler–, spoilery. So, we didn’t want to put a soundtrack out in the beginning because it was going to give away a lot of the huge moments of the season. I mean people are certainly going to want… trust me, the music is awesome and there’s more music to come and it is epic and big and special and people are definitely going to want it. But the collection really makes sense at the end of this season where you really see the whole thing kind of come together. You are introduced to a character named Lady Cane fairly early on. She has a sleeve tattoo which is unusual for females in Disney films. BEN BALISTERI : Well, I’ll just say tune into Tangled Before and After for the answer to those. I mean even with the tattoo and stuff like that, I mean I think it was just literally one of the cool things about the programmer we’re using, it’s called Harmony, is it’s sort of this blend between doing CG and 2-D. I mean technically, what we’re doing is we’re building like all of these characters in a computer by flat images that end up spinning around. In traditional 2-D animation, you could never, ever get away with a detailed tattooed. You’d kill somebody by having them to draw it 10 billion times. But in the computer, we can actually just plant it on there and have it spin around. So, some of it’s just a little bit of, of us as designers on the show being able to get in with some cool, nitty-gritty details. From a character standpoint, it definitely says something about a personality and for Lady Cane. She’s got a skull I believe with roses and stuff like that on there. Which just kind of helps sell some of the idea of her personality in the show of being a little bit edgy but also they’re being an under–, an understory there that comes from a real hurt that she went through as a child. And I, I think that tattoo, you know, if we’re going to do something like that, we aren’t just going to randomly throw something evil on there because she looks evil. We try to think of the meaning behind it. 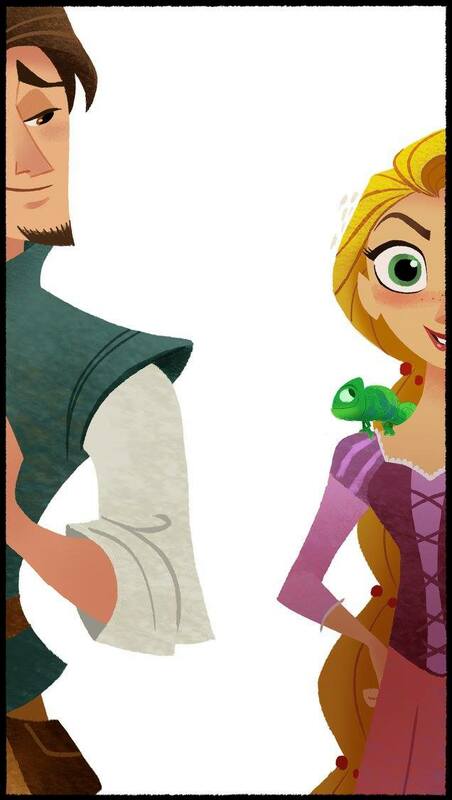 One of the newest additions in Rapunzel’s life is a woman named Cassandra. You can tell right off the bat that she is going to have a major influence on the princess. CHRIS SONNENBURG : I’m going to go back to the same thing I’ve been thing over and over again, there’s always the why. Why does Cassandra exist? Why on every level. Cassandra kind of came to be two ways, number one, in my head and then number two, well, three, mind, the writers and then when Eden Espinosa came. You know, when Eden came to voice her, she gave her another level that we could have never written. Like Eden is very much who Cassandra is. She’s very tough. She’s very vocal. I don’t know if you guys follow her on Instagram or anything but she’s a real tough, tough lady. I love her to death in Tangled Before and After. But, but you know, it started to become evident as to who Cassandra was going to be when you ask the question who does Rapunzel need in her life. And I felt like she needed somebody that had access to the castle, that had a very adventurous spirit, much like herself, somebody that Rapunzel could kind of look up to. And if Cassandra, you know, as an idea was somebody that was going to have access to Rapunzel it had to be somebody that was very close to her on a daily basis. So, that’s why we gave it to being somebody like a lady in waiting. But ultimately, she is somebody that Rapunzel can confide in and really share things with that–, like a girlfriend, like my friend’s, like again, my daughters have, have friends that they talk to in different ways than they talk to you know, the guys in their lives or me and my wife. And we wanted to give Rapunzel somebody like that. And she just, you know, as we were writing the first few episodes and kind of coming up with the concept of the show, her character almost like wrote herself. BEN BALISTERI : Yeah, storytelling’s all about contrast. And so, when you have two really diametrically opposed viewpoints on the same issue, it just becomes fun storytelling. So, Rapunzel who’s always so optimistic and so cheerful and so full of wonder and everything she meets, it’s great to have the opposite view, just a little more sarcastic and a little more down to earth and you get that different take on the same topic. It just makes for a really great storytelling. If you want to check out the first 5 minutes of Tangled Before Ever After, check out the above video! Super exciting! The show premieres March 10th on the Disney Channel. Rapunzel is destined to one day assume the role of Princess of Corona, but she’s not ready for that yet. She realizes that there is so much more she needs to learn about both herself and the world before she can take on the responsibility associated with being princess. So she goes on a journey to ready herself for eventually ascending to the throne and is joined along the way by partner-in-life Eugene, no-nonsense and dutiful horse Maximus, and tough-as-nails friend and confidante Cassandra. 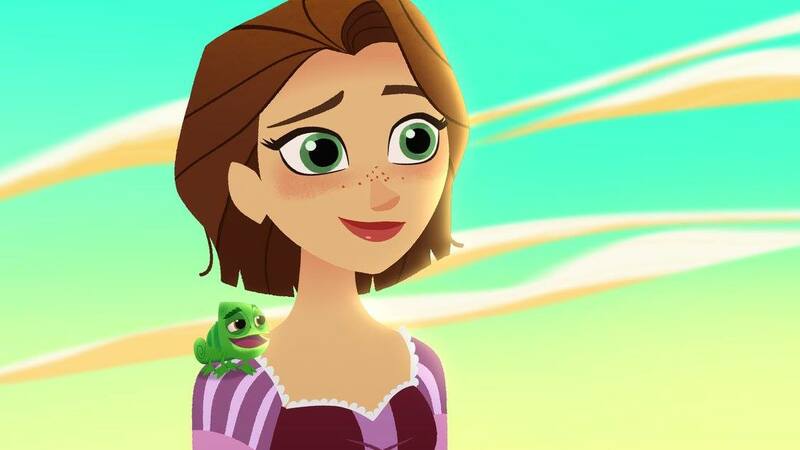 “Tangled: The Series” is a follow-up to 2010’s “Tangled” with Mandy Moore and Zachary Levi reprising their roles from the film, Rapunzel and Eugene (formerly Flynn Rider), respectively. The animated series features music by Oscar-winning composer Alan Menken and Oscar-nominated lyricist Glenn Slater, who both worked on the movie. Want to read more of my TV and Movie coverage? *Disney invited me to California to interview the Tangled team. Flight and accommodations were covered.